After 15 years, Microsoft’s follow-up to the cluttered Hotmail is stripped down, styled after Windows 8, and easy to use. Wait, Hotmail? Namedropping “Microsoft Hotmail” is enough to evoke shudders from many a webmail aficionado. The homepage is riddled with a deluge of options for sweeping, marking, moving, and categorizing each message that flows through your inbox, which you can choose to view in seven different ways. It’s so overwhelmingly clunky that it can feel taxing to use even though it’s free. Yet with 350 million active users, and fierce competition from Gmail, Hotmail remains one of the most popular email services in the world–even though its interface hasn’t changed much since 1996. Today, Microsoft is fixing Hotmail. 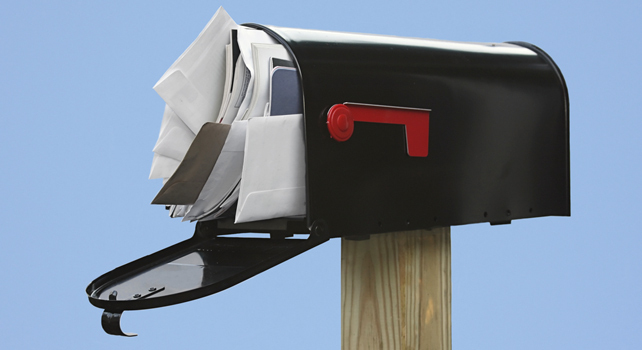 The new webmail service is both easy on the eyes and far easier to use than Hotmail ever was. Microsoft is calling it Outlook, the same name as its desktop email client, but it replaces all @hotmail and @live webmail accounts. 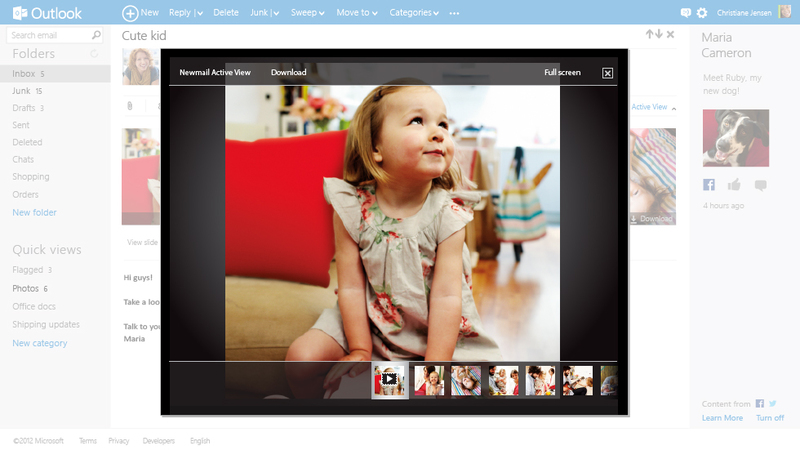 And it uses the Metro design language that lends the new Windows 8 operating system its distinct look and feel. The first thing you notice about Outlook is that it’s bare. All the clutter has been stripped out, leaving only a thin, top-navigation bar with only the most common task button: create a new message. Clicking on the Outlook icon to the far left summons a drop-down menu featuring colorful, Metro-style tiles for Mail, People, Calendar, and SkyDrive apps. It has integration with Microsoft’s Word, Excel, and PowerPoint web apps, which makes it easy to create, edit, and view document attachments from within Outlook. And it makes sense of what kinds of emails you’re getting, so photos will play in an in-window slideshow and messages including package tracking information will be tucked into a “Shipping updates” folder. 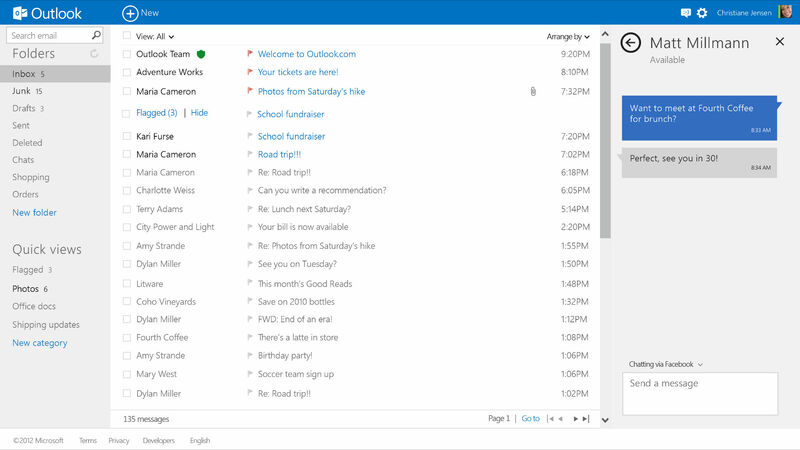 When it comes to social features, Outlook does Gmail one better. Where Gmail narrowly focuses on Google+, Outlook includes deep integration with Facebook, Twitter, LinkedIn, and other networks. 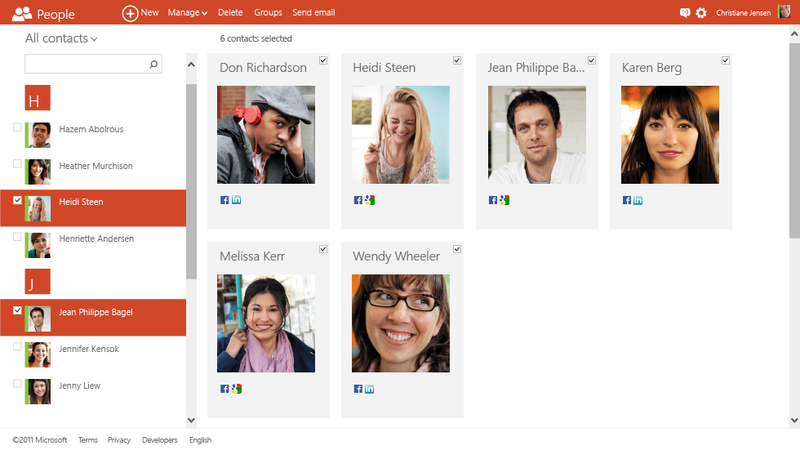 Outlook pulls together all that third-party information to create a universal address book, which means when you view your contacts under the “People” tile, their entries will automatically populate with any info they’ve publicly shared on their social networks. And anytime you add a friend on a connected social network, Outlook automatically creates an address book entry for that person. The one conspicuously missing network is, of course, Microsoft’s own Skype, which Brian Hall, Microsoft’s general manager for Windows Live and Internet Explorer, tells Fast Company is in the works. It’s not perfect yet. Navigating between the separate Metro-style tiles for mail, contacts, a calendar, and SkyDrive feels a bit clunky, for example. But it’s a solid attempt to reinvent a space that Gmail stole away in 2004, and that service now claims 425 million active users. Outlook tries to solve a problem Gmail never did very well, which is to “smartly” interpret what kinds of emails you’re getting, so it can efficiently sort daily deals subscriptions from newsletters and social network notifications from personal emails from friends and family. And a little competition is great news for email innovation, which should get especially interesting now that Google has acquired the developers of the cult favorite email app Sparrow.